Are you having trouble getting accurate information on your inventory? Home Facing trouble getting accurate information on your inventory? 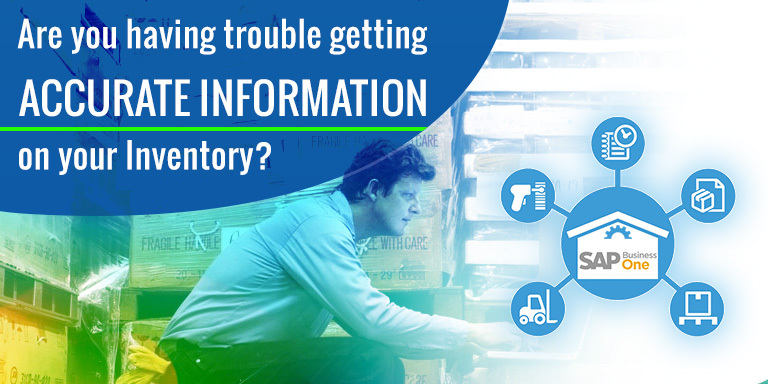 Facing trouble getting accurate information on your inventory? Manufacturers, Wholesalers & Distributors are under constant pressure to balance the constraints of time, money and personnel. As the company grows and expands its reach in terms of products and customers, the resource constraints it faces become greater and more intense. As customers and products are added, the Supply Chain Management challenges increase, leading to the need for as sophisticated Warehouse Management System (WMS) solution. A WMS solution becomes the “must-have” technology for any company looking to become a market leader. Only by integrating the WMS to the existing ERP solution can the true benefits of improved visibility, traceability and productivity be fully achieved. Inventory is the backbone of the supply chain. A WMS solution provides accurate, real-time visibility of inventory. This is done by balancing the needs of customers who require same day shipments (captured in the ERP solution) with the efficient shipment of products (managed within the WMS). The WMS solution provides the central repository for the critical information needed by supply chain managers, giving them full visibility, not only of future demand but also pending deliveries thus reducing the likeliness of overstocking product. The WMS also allows the company to optimize the use of storage areas and bin locations on the distribution side of the warehouse. Implementing WMS leads not only to more accurate and better-managed inventory but also to lower distribution costs, increased profitability and better customer service. The best gauge of the benefits of implementing WMS is how well the business operates in terms of customer satisfaction. With narrow delivery windows, even minormiss-steps and miscalculations can have major service level consequences. The WMS reduces human errors, ensuring that the products customer orders are not only in stock but are shipped on time. The WMS within the SAP Business One solution organizes sales orders and tracking shipments. It keeps the customer in the loop by sending automated notifications of sales orders status including the tracking number of the shipment, so that proper delivery expectations are set and met. These connections lead to improved customer satisfaction and lower customer service costs, as the automated notices reduce the number of inbound calls from customers looking for sales order status.